If you’re looking for a local professional moving company for your Draper, Utah move, then consider Moving Connections. Why? Because Moving Connections is a Moving Company offering the best local moving help in Utah. Moving Connections also offers straightforward pricing estimates with no last-minute add-ons or surcharges. You just pay for time, tape and boxes. So if you’re reading this on a mobile device, click here to be connected with a professional moving service representative, or you can contact us by phone or via email. With more than three decades of shipping and moving service to the Wasatch Front and throughout Utah, Moving Connections knows what it takes to be a frontrunner in the local Utah Moving Services industry. That’s why we’re a federally licensed, bonded, and insured moving company with a Motor Carrier Number. And that’s why it’s Moving Connections’ policy to hire only those who have had previous experience in the moving business. And Moving Connections also offers a potentially dollar saving “labor only” move for do-it –yourselfers who would like to get the most bang for their buck. If Moving Connections is moving you to Draper it's a perfect time to begin to utilize the many resources and bounties of Draper. For example click on the picture to the left to go the Moving Connections 'Support - Advice - Assistance' page and discover Draper for the first time. Once you are on the 'Support - Advice - Assistance' page go ahead and open the .pdf link found there and tape the list of emergency and useful phone numbers on your refrigerator. Moving Connections has gone to great pains to find those links and connections to integrate you quickly into Draper life. A Moving Connections “labor only” move allows you to do most of the packaging of all your household goods while our professional Draper moving team tackles the really heavy and tricky stuff. So you get to pack all of your kitchen stuff, plus your clothing and other such items while our crew takes care of wrapping and loading your gun safe, pianos, and other heavy or bulky things. Think of it as something like “sweat equity” when building a home. You also provide your own truck and driver, which stretches your dollars even further. We at Moving Connections think of ourselves as being in the business of moving families, not things. Whether you’re a family of one or a family of many, Moving Connections stands ready to provide the smoothest transition to your new home. We understand the pressures that are put on you and the complicated little details that have to be taken care of throughout the moving process. And that’s why Moving Connections provides the best full service residential moving experience along the Wasatch Front. To leave you to tend to the more important items of business while our professional moving team takes care of wrapping, packing, and professionally loading our moving truck. And speaking of full service, Moving Connections also has storage space available in the Salt Lake Valley, and that includes climate controlled storage as well as conventional storage space. So contact us to get a free moving cost estimate, or to arrange details of your Draper move, or to answer whatever moving questions you might have. 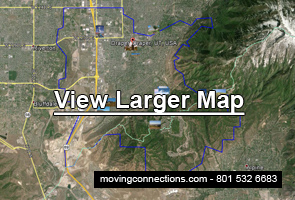 You’ll see why Moving Connections is a leader in the moving industry in Northern Utah.